Cairns Port Development - "Knowledge is power". Better-management.org has invaluable information for better decisions. "Knowledge is power". Better-management.org has invaluable information for better decisions. Cairns Port Development - "Knowledge is power". Better-management.org has invaluable information for better decisions. 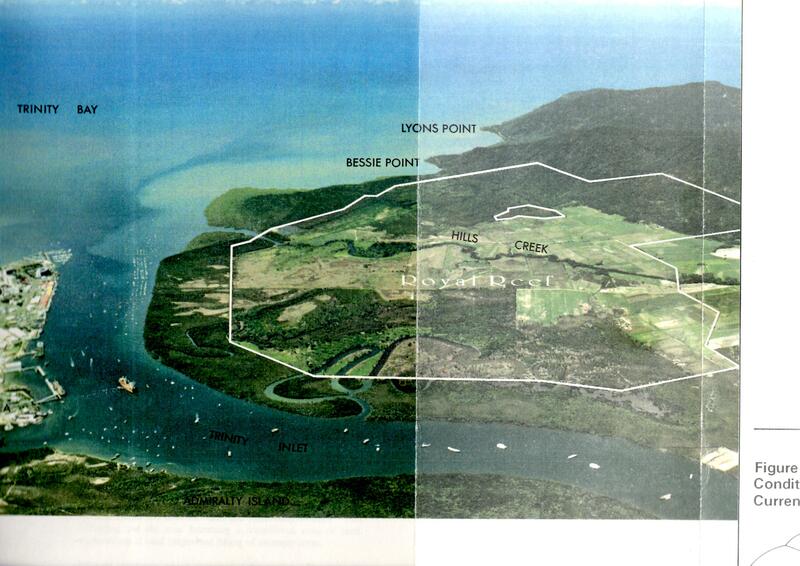 This post presents a chronology of issues and events relating to Cairns Port development, including East Trinity. Scroll down for more background and sections 1 – 7. TRINITY Inlet dredging advocates have questioned how Cairns Shipping Development costs have blown out by $7.6?million despite the project being scaled back. Cairns Port Development president Ron Crew was baffled by the $127.6 million price tag issued since Building Queensland completed its detailed business case. He said the estimated volume of marine sediment for relocation as now 740,000 cubic metres to be dumped at the Northern Sands quarry and 50,000 cubic metres at the end of Tingira St in Portsmith, despite approvals being in place for up to 1 million cubic metres. “The question is: If the volume of relocated marine sediment is the lesser amount of 790,000 cubic metres, what amount may the cost estimate reduce by?” Mr Crew asked. “We would expect the overall cost may only reduce marginally as the majority of cost is the bund walls, pumps, piping and dredging, that are fixed costs. “We consider this to be a very expensive project in comparison to alternative locations that may have been used. Mr Crew ships entering the port would be limited to 300m in length, ruling out the 320m Voyager class which would be the dominant cruise ship in Australian waters by 2026. “The project is delayed, is very expensive and is insufficient”, he said. THE dredging of Trinity Inlet is shaping up to be a multimillion-dollar windfall for former Cairns pub baron Tom Hedley. The former high profile developer is the owner of Northern Sands, the Holloways Beach quarry where 1 million cubic metres of dredge spoil is proposed to be dumped, as part of the Cairns Shipping Development Project. Development applications for earthworks associated with the $120 million project — to widen and deepen the city’s shipping channel to accommodate larger cruise ships — were lodged last week with Cairns Regional Council. The plans detail the first phase of the project, involving the construction of the “Northern Sands Dredge Material Placement Area” on land within the Barron Delta, containing Mr Hedley’s sand quarry, waste disposal and processing facility. New bunds would be built at the quarry, which would be used alongside the placement of soft clay dredge material from Trinity Inlet. The dredge spoil is to be delivered from the inlet into the area as a slurry through a 7.5km pipeline. Ports North’s revised environmental impact statement (EIS) for the project shows site acquisition for the land placement of the dredge spoil will cost $10.8 million. Compensation costs to other land holders may also be part of the site acquisition costs. Mr Hedley declined to comment yesterday, citing a confidentiality agreement with the port authority. Editor’s note: Approval has still not been received for several aspects of the dredging project. THRIVING trade and steady tourism have doubled Ports North’s net profit over 12 months, prompting calls for Trinity Inlet dredging to be listed as a priority project. The corporation recorded a $16.1 million net profit at June 30, compared with $8.8 million last year. Ports North chairman Russell Beer said the corporation had been actively targeting trade “rather than just waiting for it to come in”. “We’re seeing a lot more commercial activity through the port, more than we’ve probably seen for about 60 or 70 years,” Mr Beer said. Cargo for the Mt Emerald Wind Farm and Rio Tinto’s Amrun (Weipa) mine projects has increased Ports North’s trade revenue, resulting in a $3.5 million boost in the underlying operating result. The port also secured the contract as the supply port for cargo for the new $75 million green energy power plant at the Arriga sugar mill. An increase in super yacht and cruise visits also helped. Mr Beer said the loss of the Pacific Eden’s home port in Cairns shouldn’t adversely affect next year’s figures. “The cruise ship isn’t one of the key drivers to our profitability,” Mr Beer said. Cairns Port Development president Ron Crew said it was important to upgrade facilities to keep it financially healthy. “We have Northern Australia’s most used port … and we seem to get left behind all the time,” he said, adding that the dredging needed to be a priority project. Ports North has been allowed to retain this year’s dividends – normally paid to the State Government – as partial contribution to dredging costs. Following approval of the environmental impact statement, Ports North is working to obtain all relevant approvals to move the dredging project to the construction phase. Mr Beer said work could start after the wet season. “A couple of years ago there were less than 20 vessels coming in; now we have more than 60, so the trajectory is in the right direction,” he said. The recently released Queensland Ports Association report, Sediments and Dredging at GBR Ports report, June 2018, provides the figures for Cairns port on page 5. Cairns port-related re-suspension of sediment is 1% of the total natural load; that is, tidal, wind and waves, and in any case is far from the reef. The ‘Save the Reef’ activists greatly exaggerate the re-suspension loads, and so the supposed related costs. These and similar furphys led to government policy such as the Reef 2050 Plan that initially caused our port development project to triple in cost based on several invalid assumptions, then get downsized and now delayed as well as banning future expansion. The opportunities lost to our local economy are already valued in the 100’s of millions of dollars. Advance Cairns received special mention in the Queensland parliament Hansard records on the 10th of November 2015. Then the Minister for State Development stated that Advance Cairns supported a downscaled Cairns port that effectively condemned it to a backwater small scale port. Today we still bear the brunt of the failure of Advance Cairns to support our port even though we have the largest population in Northern Australia with the largest marine servicing sector, reef tourism and fishing fleet based at the port. Industries in Cairns are lamenting the stagnation of port modernisation progress, yet Advance Cairns hosted the Prime Minister last week who appears unaware of the Commonwealth Governments draconian Reef 2050 plan imposed regulations with no solutions on offer. Moving marine mud to create a deep shipping channel within the harbour operating limits does not harm the reef. Advance Cairns is not advancing Cairns port. Advance Cairns appears beholden to the interests of a few including the Queensland government-owned Ports North, a major sponsor of Advanced Cairns. The question remains, when is Advance Cairns going to do as their name suggests? What would be the alternative costs to place the bulk of the dredging spoil on the state-owned East Trinity site? The existing bund walls on this site would need minor upgrades, the site is closer to the planned dredging and the spoil would fix the serious and costly acid sulphate soil problems caused by the State ignoring CSIRO advice. Would the East Trinity site involve less overall environmental issues? If the spoil is pumped to Hadley’s quarry, could the raised area be suitable to convert later to industrial land? The East Trinity site was evaluated in Ports North’s 2015 draft EIS report for the dredging project. A submission to the Coordinator General noted serious flaws in the report’s assumptions. The former high-profile developer is the owner of Northern Sands, the Holloways Beach quarry where 1 million cubic metres of dredge spoil is proposed to be dumped, as part of the Cairns Shipping Development Project. IF POLITICIANS are waiting for a mandate to ramp up dredging in Trinity Inlet, they have it now. Four years. Three polls. No change in opinion. The Cairns Post’s recent Your Say on the Far North Reader Survey asked if the current dredging program should be expanded to allow bigger ships full of tourists to dock. An overwhelming 80 per cent of respondents backed the idea, in almost perfect synchrony with previous independent appraisals. Compass Research conducted a random survey ahead of the 2016 local government elections and discovered 82.5 per cent of residents supported deepening the shipping channel. A couple of years earlier, another Compass survey commissioned by Ports North found 78 per cent of people supported dredging. The key difference this time is that dredging has been approved – subject to a protracted business case from Building Queensland – but not to a satisfactory degree for Far Northerners. Cairns Regional Council Mayor Bob Manning believed politics, not economic and environmental realities, had triggered the current scaled-down 1 million cubic metre dredging plan. The 2014 study for the Newman government’s since-abandoned 4.4 million cubic metre proposal found dredge spoil could be placed at a depth of 28.7m with basically no dispersal – even in cyclonic conditions. “Dredge material deposited at that level does not move,” Cr Manning said. Cairns Shipping Development Inc spokeswoman Emma Thirkell hoped Building Queensland was taking so long on the business case because it had realised the current proposal to cap cruise ships at 300m in length would be a wasted opportunity. “I hope they might be allowing a redesign of the channel so they can get the Voyager class in,” she said. “They’re up to 320m long. “To tack on a bit more doesn’t have to be expensive. “We would still work on getting the Reef 2050 Plan amended because of what that does to investor confidence. Proponents for a return to the original, quadrupled-in-scale project say the Federal Government is not free of blame, with its Reef 2050 plan banning placing capital dredge spoils at sea. “It has to be amended,” Ms Thirkell said. THE boss of Australia’s biggest privately-owned shipping company says Cairns has three options – expand the port, cap the population or let future generations starve. Sea Swift CEO Fred White has outlined a proposal to transform Admiralty Island into Northern Australia’s premier logistics hub, complete with road and rail access and a fuel tank farm removed from the mainland. The idea has been bandied about for decades, only now undergoing a resurgence amid Trinity Inlet dredging’s awaited start and predictions of the region’s population doubling to 500,000 by 2050. Mr White dared politicians to stake a claim for the future or watch jobs float away to centres willing to dream big. “The hub incorporates a railhead, major road access realignment, laydown areas, and to remove the current constraints limiting existing port operations,” he said. “Importantly, this concept provides certainty and optimism for current and prospective operators and users and will encourage private sector investment. Port land is facing death by a thousand cuts, with concepts like the State Government’s global tourism hub casino-resort expected to remove another valuable bank of potential growth land. Even the approval for Hemingways Brewery to take over Wharf One raised questions over the State Government’s long-term vision for the port. Mr White said the lack of an overarching strategic plan to 2050 meant piecemeal developments such as Mourilyan Harbour upgrades or shoe-horning cramped infrastructure into the existing Cairns port would occur sporadically. Even then, the available land may have a rapidly approaching shelf life. Cairns only imports fertiliser and fuel by ship, but the scenario will be very different once this century is half exhausted. Mr White said containerised imports would be necessary once the population reached a critical mass unable to be served solely by road. Royal Australian Navy, Boarding Party personnel demonstrate a search on a simulated suspect vessel during the Live Exercise demonstration at the Proliferation Security Initiative, Exercise Pacific Protector, 17 held at HMAS Cairns on September 9. Like Sea Swift, he said major freight firms like Toll and Linfox would want to invest in a state-of-the-art logistics hub on Admiralty Island. “We’re not quite there yet, but that population is coming and it’s coming at a rate of knots,” he said. Sea Swift faces a battle getting the proposal considered by government, with major environmental and cultural concerns about developing the island, particularly considering the volume of dredge spoil necessary to reclaim the land. Mr White said he was ready for that conversation, noting Portsmith was swampland until dredge spoil made it usable. “You move it once and it’s future-proofed,” he said. “It allows foreshore development, but more importantly it allows a working port future. ENTERPRISE North has taken aboard Sea Swift’s proposed Northern Australia Logistics Hub as one of its key infrastructure policies. The fledgling regional advocacy group’s president Kevin Byrne said the time was right to get Ports North, Cairns Regional Council and the State and Federal governments to the table. He said the concept needed to be integrated into the council’s strategic plan, as well as “agile thinking and innovative funding” from all levels of government. “Marine-based activities will play a decisive role in our future economic fortunes, providing for employment and domestic and international trading opportunities,” he said. “We have oodles of land, deep water off Admiralty Island, and we are at the end of the northern rail line and the Pacific Highway. The possibility of moving HMAS Cairns was discussed but not deemed make-or-break, given existing operators’ shift would open up new Defence land in Portsmith. Representatives from all three tiers of government have received informal presentations on the proposal, along with several marine operators who have showed varying degrees of enthusiasm. Mr Byrne said the next steps were to work through the details and arrive at a general agreement about progressing the various and staged components of the plan. “We have the Northern Australia Infrastructure Facility here available to support these sorts of projects provided that there is the agreement between Federal and State governments,” he said. “We create an additional industrial land bank, we relocate the fuel tanks farm to a new and more appropriate location on Admiralty Island, and free up and value-add land within the city in close proximity to the CBD. “We can look at the growth of HMAS Cairns through a new set of eyes and provide some real impetus behind the mooted Cairns Marine Maintenance Precinct. Cairns MP Michael Healy is not yet convinced Admiralty Island is the right solution. PICTURE: BRENDAN RADKE. THE only way Cairns MP Michael Healy sees the Admiralty Island pitch gaining traction is if Defence opts to shift HMAS Cairns across the inlet. “If the Federal Government wanted to build a Defence facility at Admiralty Island, then the Federal Government would have the legal right to do so,” he said. That foray could set the ball rolling for further development, but Mr Healy (above) was not ready to back the proposal without proper scrutiny. “I think it’s fabulous that we’ve got a significant marine operator in our area that thinks they should be expanding to other areas,” Mr Healy said. “The authority that is charged with the ongoing development and future needs of our port is Ports North. “Ports North is made up of a board of selected individuals, the majority of them have been influential locals. MAYOR Bob Manning hoped developing the untouched island between Cairns and East Trinity will not be necessary, but said it may be inevitable if the working port keeps losing space to expand. “When the City Port masterplan was passed by the Cabinet, it defined the boundary between the City Port and the working port,” he said. “There was never to be any stepping over the line into the working port. Cr Manning (left) said Cairns’s shipping potential was going backwards, despite multimillion-dollar promises of investment from governments. “The port has probably the highest density of people of any part of the city,” he said. “It (Ports North) is there to protect, preserve and provide for the future port needs of Cairns. “It’s not there to shut these businesses out. SHIFTING HMAS Cairns off the mainland has Leichhardt MP Warren Entsch’s wholehearted support – and he says the scheme is nothing new to Ports North. “The Port Authority has already done a concept plan, and the base fits perfectly over there,” he said. “The fact is, Defence has already committed close to $750 million for upgrades over the next 10 years. Mr Entsch (left) said a letter of support from the State Government would help shore up the proposal’s legitimacy in the Federal Government’s eyes. PORTS North is due to create a new development masterplan over the coming 12 months. “Since 2006, trade demand has been consistent with the masterplan, and the existing infrastructure does not constrain any of the port operations,” a spokeswoman said. The work will include “significant stakeholder and port user consultation”. THE term lingchi refers to the ancient Chinese “lingering death” torture and execution process, whereby tiny portions of a person’s body are gradually sliced away until the sweet release of death finally arrives. Port land in Cairns is slowly but surely going the same way as those poor tormented souls – a finger lopped here for an admittedly lovely brewery, a big toe there for a “global tourism hub” casino. We can survive on what we’ve got now, but eventually a critical mass will be reached where we need major port growth to allow imports as well as exports, just to keep us fed, clothed and employed. Cairns has the biggest locally-based commercial marine fleet in the state with 1600 vessels – more than Brisbane’s 1200 and way above the 600 on Townsville’s books. According to the 2016 census, it boasts the greatest employment in marine activities in Northern Australia, and the region’s population is also the fastest growing in the North. Unless we take off the blinkers and look far ahead to 2050 and beyond, places like Darwin will catch us with our dacks down. Turning Admiralty Island into a logistics hub may or may not be the answer, but it is at the very least a strong prospect that will become inevitable if this death by a thousand cuts is allowed to continue. The benefits are obvious, but the cultural and environmental concerns cannot be ignored and will be a bloody minefield to negotiate. Leases on the fuel farms in Portsmith start expiring from 2024, and the Federal Government is talking about spending $750 million over a decade on the marine industry with little detail on where it will go. It’s time to start the discussion. FUNDING for the dredging of Trinity Inlet is not expected to start flowing at least until next financial year. The Palaszczuk Government has been criticised for not including any new funding for the Cairns Shipping Development Project in the 2018-19 State Budget. The only mention the project receives in budget papers is a commitment to “progress approvals” for the widening and deepening of the city’s main shipping channel. A spokesman for Transport Minister Mark Bailey said $60 million towards the project was already committed in the 2017-18 budget, subject to the business case stacking up and all relevant environmental approvals being obtained. “That commitment, of course, remains,” he said. “As identified in Budget Paper 2, the Port of Cairns is continuing to progress regulatory approvals. “The Port is currently awaiting Federal approval of their EIS (Environmental Impact Statement), and the business case for the project is being finalised. The initial project involved the removal of 4.1 million cubic metres of dredge spoil from Trinity Inlet, to allow larger cruise ships to berth at the port. The project’s scope was reduced last year to allow 1 million cubic metres of spoil to be dredged, for better environmental and economic outcomes. Cairns Port Development president Ron Crew, whose group has been fighting to have the channel dredged since the early 2010s, said it sounded like the project had stalled. “I’m really disappointed in it not getting the green light,” he said. “I am aware that Townsville Port has received about $1.6 billion, where we were promised $120 million. “It’s almost laughable that we get left out of it. The Coordinator General’s evaluation report on the environmental impact statement for the Cairns Shipping Development Project is now available. The Coordinator General’s report covers a massive range of environmental considerations, but is silent on these two points. Options for placement of spoil at East Trinity in the 2015 draft EIS had major errors noted in submissions to the CG. East Trinity is not even mentioned in the CG report. The 2012 Ports North proposal included 10.5 million cubic metres of spoil; the 2015 plan had 4.3 million and the current proposal is ‘less than 1 million’. Until Ports North presents a full benefit-cost assessment that demonstrates the current plan is the best option, no one, including the CG, should accept the present plan is optimal for the Cairns Region. It doesn’t even pass the ‘pub test’. The Cairns Post article ‘Port must dig deeper’ (24/7) notes Federal Minister Matt Canavan ‘has promised to take up the fight for a more extensive plan…’. After 5 years and over $8m preparing reports, the revised EIS report is at best a temporary fix; only a quarter of the dredging previously proposed. But current legislation would prevent any further ‘capital’ dredging projects for two decades. It is vital that the current proposal be extended to be just the first phase of a longer-term project. The current proposal to pump all spoil into sand pits by the Barron River is preferred to the alternative location at East Trinity. However, the report’s reasoning comprises mostly subjective assessments and a few unconvincing quantitative comparisons. The next immediate step should be preparation of a detailed cost/benefit plan for a long-term phased dredging plan that includes credible comparisons with an alternative to place immediate and future spoil at East Trinity. DREDGING supporters have dusted off calls for East Trinity to be transformed into a new residential suburb built atop huge amounts of spoil scooped from the bed of Trinity Inlet. Members of the Cairns Port Development group took ­Senator Matt Canavan and the Cairns Post on a helicopter tour of the city to point out ­potential sites where dredge spoil could be dumped. Well-known authority on the issue Norm Whitney ­rejected the notion East Trinity was an environmentally ­important natural wetland, pointing to a photos from 1988 showing it was covered by cane farms, grazing land and a healthy melaleuca forest. Hundreds of those trees now stand dead and leafless in artificial stagnant ponds. “Compare that to the present environmental mess we overlooked where the now ­former high-and-dry farming land is overgrown with secondary growth vegetation and weeds and is a habitat for feral pigs and other vermin,” Mr Whitney said. A CSIRO study found the lower sections of East Trinity were 1.4m lower than the original land level. The group appealed to Mr Canavan to use his political ­influence to have Cairns classed as a priority port and the original 4.4 million cubic-metre capital dredging plan to be reinstated rather than the current scaled-back version. A dead melaleuca forest now sits in stagnant water at East Trinity. “The port has to be determined to be a strategic port and the dredging be able to continue as necessary,” Mr Whitney said. Maintenance dredging is ­already undertaken annually but Down Under Cruise and Dive managing director Peppi Iovanella said it barely touched the surface. He pointed out yachts and small boats actually avoiding the path set by floating leads directing users to the supposedly safest channel to the port, despite maintenance dredging being carried out just last week. “It’s a joke. It’s not really dredging and it’s not safe. It’s not even maintenance dredging. It’s negligible,” he said. The Cairns and Far North Environment Centre and Ports North could not be reached for comment. FEDERAL Minister for Northern Australia Senator Matt Canavan has pledged to take up the fight for a more comprehensive dredging scheme and further development of Port of Cairns. “The port development is crucial to the future of the Cairns economy, especially to ensure it builds a diverse and resilient economy,” he said. Note: click on the thumb print if article does not show. 22 June 2016. Excellent news that Cairns Port development seems to be back on track. The Cairns Post, 22 June, reported ‘PORTS North will zero in on two possible locations to dump one million cubic metres of dredge spoil from Trinity Inlet. The Cairns Post yesterday revealed dredging of the Cairns shipping channel would be fast-tracked to allow cruise ships up to 300-metres long to dock at the city’s port. City leaders welcomed the revival of the project, which would have a total cost of about $120 million. Ports North chairman Russell Beer said the organisation would work hard over the next 12 months to complete a rigorous environmental impact statement and “turn that into an approval”.’ Some background: After Ports North presented a practical plan in 2012, something happened causing their plans to veer off course. Was this applying fashionable ‘green’ ideology? Over $5 million dollars spent on consultants produced a draft EIS, checked by the Coordinator General and passed to Treasurer Pitt who pronounced the port development far too expensive at $365 million. This draft EIS was shown to have major flaws. Now different consultants indicate dredging only 1 million cubic metres of spoil – 23% of the previous 4.4 million – will enable larger cruise ships up to 90,000 tonnes and full fuel and sugar cargo ships to navigate the harbour. The proposal includes innovative ideas such as pumping the spoil to an underwater location in a sand pit, so no expensive treatment will be needed. Also, an East Trinity site is favoured – presumably to cover the small highly polluted area, as recommended by CSIRO in 1999. Hopefully the new plan, costed at $120 million, will now be expedited. It seems fair for the cost of this essential infrastructure be shared equally by the Federal and Queensland State governments. 8 June, the Cairns Post included an impressive 20-page supplement that presented a wide range of articles explaining the issues and benefits available from widening and deepening the Trinity Inlet. The lead-article was an open letter to the Prime Minister, leader of the opposition and the Queensland Premier asking for their support to expedite the port development project. 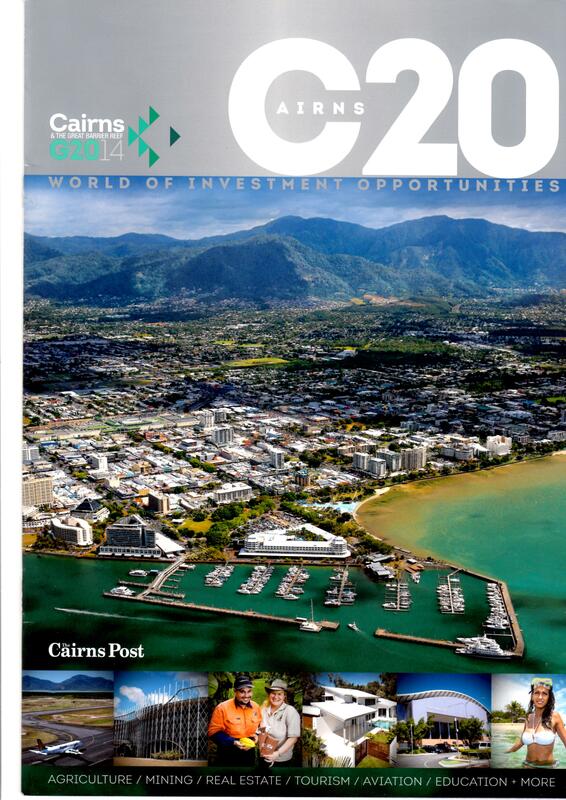 The supplement is complimentary to the March 1 report to the Premier Cairns Port Development Report to Ministers. 1 June 2016: Advance Cairns, the peak independent non-government Advocacy and Economic Development Organisation for Tropical North Queensland (TNQ), advised on its new website: ‘RECOMMENDATION – Prioritise Cairns port infrastructure as a strategic investment in the regional economy enabling long-term sustained growth for tourism, Navy, port and service industries. Commit to this $1B industry by supporting the EIS process and implementing the CSDP’ (Cairns Shipping Development Project). The announcement continued: ‘Project Timelines – The final cost will be assessed as part of the revised Environmental Impact Statement (EIS) with expenditure in 2017-20. EIS commenced and extended until June 2017′. This very welcome announcement appears to override Advance Cairns and the Cairns Chamber of Commerce previous submission to the Coordinator General which concluded ‘We believe that the Cairns Port will need to continue to incrementally develop the inlet and associated port infrastructure’. http://www.advancecairns.com/project/shipping-development/ and Cairns Chamber, Advance Cairns submission. The Cairns Post editorial, 17 May, noted the state government’s record of blatantly ignoring the results of it’s own consultation. ‘First there was the public hearing regarding dredging the Trinity Inlet…Business people presented a great case to have Cairns included as a “port of significance” that would allow large-scale dredging…They were so successful that the people hearing the arguments recommended the Government include Cairns on that list. ‘ The result? The Labor State Government kowtowed to the Greens and ignored the recommendation of it’s own committee. So much for democracy! (Click on editorial graphic to expand). A letter published in the Cairns Post, 5 April, summed up the current impasse: ‘I refer to the Cairns Post story “Make Aquis Happen – Stop mucking around’ (26/03). “A Cairns business leader is warning Queensland Government to stop playing politics with … Aquis”. Then on page 23 “Cairns a jobless hotspot – Cairns was still 2.1% above the state average.” (7/3) I also recall the article “HMAS Cairns major expansion to make it key northern defence base. The confidential documents, obtained by The Cairns Post, reveal a new role for the city that includes dredging the inlet and expanding the base to accommodate 3000 personnel in an estimated $2 billion boon to the local economy.” Since then, it has been a deafening silence. Also, a recent report sent to the Premier and ministers explained how the reasons given for delaying Cairns Port development have been overcome. The report (see www.better-management.org) recommended the State government should expedite completion of a “shovel-ready” project plan. The total inaction suggests the rumours after the State election that the Greens did a deal with Labor to prevent large-scale projects in Cairns were true. Sorry Cairns, you’ve been dudded by your Governments.’ Note: The report can be downloaded from Cairns Port Development Report to Ministers. The report includes: ‘An independent group of specialists should be contracted as soon as possible to deliver a ‘shovel-ready’ plan to complete the port development, including a full benefit-cost analysis. Suggested terms of reference for this assignment are at Cairns Port Deepening Plan, TOR 081115. An article in the Cairns Post, 7 March, noted: ‘TOP-level documents reveal plans to triple the size of HMAS Cairns as northern Australia’s key strategic naval base. The confidential documents, obtained by The Cairns Post, reveal a new role for the city that includes dredging the inlet and expanding the base to accommodate 3000 personnel in an estimated $2 billion boon to the local economy.’ See http://www.cairnspost.com.au/news/cairns/hmas-cairns-major-expansion-to-make-it-key-northern-defence-base/news-story/975d9b137efb74d8479f7588ef4f2a27 . Also John MacKenzie discussed the issue with former head of the Australian Army Lieutenant General John Grey: http://www.4ca.com.au/mornings/50986-will-the-feds-force-the-dredging-project-to-happen. CPDI presentation to Coordinator General – Cairns Port Development Inc. made a presentation to the Queensland State Coordinator General from a high-level suite near the Trinity Inlet on 8 December 2015. The venue allowed the presenters to point out the CoG the major developments in Cairns that had been achieved over half a century using spoil dredged from the inlet. The presentation described the many issues relating to the proposed port development proposal, including several errors in the Ports North draft EIS such as the exaggerated costs. The major benefits the Cairns Region would gain following the proposed development were explained, together with tables showing the calculations. The Power Point presentation can be downloaded from: CPD Inc. Presentation to the Coordinator General, update. A letter from Peter Campion, Tolga, in The Cairns Post, 2 January, summarises the current deplorable status: ‘Doctor Fanny Douvere, the marine program coordinator at UNESCO’s World Heritage Centre, does not expect the Abbot Point port expansion to hurt the Great Barrier Reef. Yet here in Cairns, the State Labor Government, using dodgy legislation and its fully-owned company Ports North, is continuing to delay the much-needed improvement of our port. Our local “environmental experts” at CAFNEC help the ALP’s anti-Cairns cause by spreading blatant falsehoods about our port, including that dredging it will kill the Reef. Science has proven our anti-port minority wrong at every step and now even UNESCO agrees dredging is not a problem. For Far North Queensland to be truly sustainable, we need our port to be fully functional. It’s now clear that to return our port to full efficiency we need to expose CAFNEC’s propaganda and to dump the ALP at the next election.’ Note: responding to a letter criticising this letter (09/01), Campion replied (CP letter 07/01): ‘(The writer) has been conned by CAFNEC and the anti-Cairns ALP and seems unaware of local history’, followed by supporting evidence. An ABC Rural article noted Dr Fanny Douvere, marine program coordinator at the World Heritage Centre and involved in the recent UNESCO decision not to list the reef as ‘in danger’, said: ‘Port expansion is not an issue if it is managed well’. http://mobile.abc.net.au/news/2015-12-24/unesco-not-worried-by-reef-ports/7052924?WT.mc_id=newsmail. This article gives the lie to many related statements from Federal and State Governments and other ‘green’ organisations. Treasurer and acting State Development Minister Curtis Pitt has instructed Ports North to focus on ways to increase the size of ships entering the city’s port. While full-scale dredging has been ruled out, Mr Pitt said dredging the mouth or approach channel to the Trinity Inlet shipping waterway and the swing basin was expected to be included in the EIS. Rather than ‘expected’, the EIS TOR required this inclusion. Wholesale dredging has been ruled out on the grounds of cost (estimated at $100m) and a ban on dumping dredge spoil in the Great Barrier Marine Park. The terms ‘full-scale’ and ‘wholesale’ dredging have not been defined, so are meaningless. Again, the draft EIS described options for on-land placement of spoil, albeit at a grossly exaggerated cost. The dredging was to allow larger ships, particularly cruise liners, to navigate the channel. The Government wants the port to look at dredging parts of the channel and the swing basin so bigger ships can enter and turn around. This is precisely what the draft EIS was directed to do. The Cairns Shipping Development Project is able to proceed under the transitional arrangements as part of the Sustainable Ports Development Act 2015 passed in the November 12 Parliament sitting. So the Sustainably Port Development Act 2015 was a complete red herring as far as Cairns Port is concerned – a massive distraction from the main event. “The scope of the project includes capital dredging of the swing basins and Trinity Inlet and deepening of the approach channel to the port”, Mr Pitt said. Mr Pitt said previously the Reef 2050 report, on which the agreement signed by Federal Minister Greg Hunt with UNESCO is based, precludes ‘capital dredging’ in Cairns Port, which Mr Pitt said the Cairns Shipping Development Project would require. In fact, the Reef 2050 report states ‘Dredging can either be capital dredging, for new channels and berths, or maintenance dredging, necessary to maintain existing and approved dredging areas.’ (Reef 2050 plan excerpts.) The Cairns Shipping Development project requires ‘maintenance dredging, defined as ‘to maintain the safe and effective ongoing operation of a port facility’. Mr Pitt said the Coordinator-General had allowed Ports North until June 30 2017 to re-submit an EIS for the project. Ports North contracted their consultants in April 2013 to produce a draft EIS report that covers everything Mr Pitt says he wants. The draft EIS did not adequately cover two key requirements of the TOR: ‘Sufficient baseline economic data to underpin a comprehensive assessment of the direct, indirect, cumulative, costs and impacts of the project’. And ‘The indirect impacts likely to flow to other industries and economies from developing the project, and the implications of the project for future development.’ Competent specialists could complete these two requirements in a few months if they were directed to do so. An extension of 18 months, when there has already been a delay of more than 12 months, is completely unnecessary, and can only be deliberate procrastination. “Granting this extension gives Ports North more time to develop a project that is economically and environmentally sustainable for the expansion of Cairns Port”, he said. Nothing additional to the requirements of the original EIS TOR has been requested. It must therefore be concluded that Mr Pitt’s announcements can only be a deliberate means of delaying the port deepening and subsequent benefits to the Cairns Region even longer. “We can strike a balance that protects the environment and supports economic development, jobs and future trade growth.” This is exactly what the CoG’s TOR for the EIS required. The editorial Cairns Post editorial, EIS backflip a big query, 220815 explains the main problem: ‘If the revised EIS suddenly comes back with a favourable opinion of increased dredging, surely this raises suggestions the government is advising its consultants what outcome they should find rather than merely letting the science do the talking.’ Not only the ‘science’, but assessing and describing in more detail the major benefits the Cairns Region will gain after the port deepening has been completed (See Cummings Economics submission Cummings Economics submission). Cairns Region will gain major benefits from port deepening, estimated at $5 billion over 25 years, including business growth and many job opportunities. See Cummings Economics submission. Australia’s long-established defence programs need Cairns Port naval base as a fully-operational strategic port for regional and coastal operations. Spoil from major dredging programs will not be discharged offshore in future, irrespective of scientific reports. Why? Because government agreements and public perceptions and reactions preclude this. 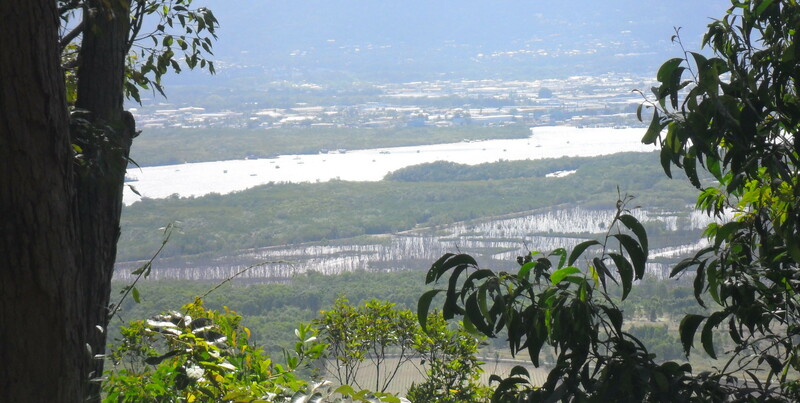 Dredging spoil has been put on land to develop Cairns city and its economy for many decades, and can be again – e.g. Portsmith. But Ports North’s draft EIS exaggerated the cost of putting spoil on land. See Submission to Coordinator General. So a new report is needed ASAP to present the most cost-effective plan and quantify the resulting benefits. Government dredging decisions, including those following negotiations with UNESCO, have been based on the Reef 2050 report, which states: ‘Dredging can either be capital dredging, for new channels and berths, or maintenance dredging, necessary to maintain existing and approved dredging areas.’ Reef 2050 plan excerpts. Port deepening: is NOT for a ‘new channel’; it IS necessary ‘to maintain (an) existing and approved dredging area’; and maintenance dredging IS allowed. …… AND IF PORT DEEPENING IS NOT EXPEDITED? The whole Cairns Region will suffer major economic, business and job losses, and Australia will not have a strategic port’ in the far north. The miniscule coven of green/Labor extremists will have won their covert battle to impose their anti-growth ideology on the Cairns Region. The State Labor Government can expect to lose the four local seats at the next election if the LNP demonstrate credible support for expediting port deepening. Cairns Region Councillors that don’t support expediting port deepening can expect to be replaced at the election next year by Councillors that do. SO WHAT SHOULD HAPPEN NOW? ‘PLAN B’? BUT…recall the Reef 2050 report, which formed the basis for Federal Minister Greg Hunt’s negotiations with UNESCO states: ‘Dredging can either be capital dredging, for new channels and berths, or maintenance dredging, necessary to maintain existing and approved dredging areas.’ The Sustainable Ports Development Bill 2015, Schedule 1 subsequently modified the Reef 2050 definition to: ‘Capital dredging – (a) means dredging or enlarging a channel, basin, port, berth or other similar thing; or’……. (b) does not include dredging to maintain the safe and effective ongoing operation of a port facility. Surely ‘effective ongoing operation of a port facility’ includes the ability for large cruise, cargo and naval ships to use the port? The Ports North proposal was submitted well before the Bill, and the EIS deadline has been extended to the end of March 2016. Minister Lynham said it is up to the CoG as to whether this deadline is extended, noting the only time an extension was not granted after a reasonable request was when the EIS was not completed after 7 years and the company had ‘folded’. The State Government has given Ports North another $350,000 (on top of the previous $5.1m) for its consultants to review the draft EIS – presumably expecting different conclusions. The latest technologies and methodologies should underpin the modified draft EIS, and result in different conclusions, including far lower costs (see Submission to Coordinator General). The modified draft EIS could satisfy all requirements: lower cost dredging of the existing channel and all spoil put on land rather than at sea (thus complying with the Reef 2050 report, although possibly a problem with the Bill’s modified definition); meeting environmental requirements; complying with Federal Minister Greg Hunt’s agreement with UNESCO to not de-list the reef; meeting Australia’s naval strategic requirements; and last but not least, enabling the Cairns Region to benefit from the major economic benefits when the next stage of port deepening is completed. How to ensure Ports North’s modified draft EIS results in expediting the requisite port deepening ASAP? A letter from Dr Anthony Lynham MP, Queensland Minister for State Development and Minister for Natural Resources and Mines, 16 October 2015 stated: ‘The government will not divert from elements of the Bill which form part of our Reef 2050 plan… However, any future development must be consistent with the government’s commitment to protect the GBRWHA and its ban on sea based disposal of port related capital dredge material.’ See Minister Lynham letter 161015. As noted above, the Reef 2050 report states: ‘Dredging can either be capital dredging, for new channels and berths, or maintenance dredging, necessary to maintain existing and approved dredging areas’ (see Reef 2050 plan excerpts.) Given that the proposed port deepening: is NOT for a ‘new channel’; and IS necessary ‘to maintain (an) existing and approved dredging area’; and maintenance dredging IS allowed, it seems the Minister is approving port deepening as further maintenance dredging, particularly if the dredging spoil is disposed of on land. 6 October, the second cruise ship anchored at Yorkeys Knob in so many weeks is unable to get passengers ashore for trips – passengers express great disappointment; Cairns reputation sullied; tour companies lose big $$$$$. 18 September: the Ports Sustainability Bill has been postponed. The Cairns Port Development Inc. petition signature sheets were handed to the Queensland Parliament at 7.28 AM on 15 September. The 4,099 written signatures plus the 2,017 online signatures totalled 6,116 – one of the largest petitions ever from the Cairns region. As a reminder, the petition reads: TO: The Honourable the Speaker and Members of the Legislative Assembly of Queensland. Queensland citizens draw to the attention of the House the Sustainable Ports Development Bill 2015 does not include the ports of Cairns and Mourilyan as priority ports. If capital dredging is discontinued, new larger passenger, naval and cargo ships will not be able to enter the ports. The estimated earnings foregone may be more than $5Bn over the next 25 years, compounding the record high youth unemployment rates. Your petitioners request the House to amend the Sustainable Ports Development Bill 2015 to include the ports of Cairns and Mourilyan as ‘priority ports’ allowing the ports to carry out vital capital works dredging NOW and always. We also request that an independent project be commissioned to assess and recommend the lowest cost environmentally acceptable dredging solution. Revitalize our economy, restore confidence and save many businesses from the brink of bankruptcy. Six months out from the local government election, Cairns lawyer Jim Brooks on Friday announced the arrival of his Connect Cairns team in front of supporters, including Cairns MP Rob Pyne. Brooks, Pyne and CAFNEC are joining forces to oppose deepening the Port and stymie the huge economic benefits the Cairns region would gain. The Cairns Post Editorial, 3 September, noted: ‘The decision by State Development Minister Anthony Lynham to consign Cairns’ port to second-tier status should cause outrage throughout the Far North….The good doctor rejected this (Committee Report unanimous) recommendation and bowed to the threats of a foreign environmental body (UNESCO) over the pleas of Cairns’ top business groups’ (http://www.cairnspost.com.au/news/opinion/second-tier-status-for-cairns-port-is-a-disgrace/story-fnjpuwl3-1227509793053). An allied issue is flagged in the Cairns Post editorial, 27 August, ‘THE State Government must act immediately or we can all watch the Aquis ship and its bounty sail out of the (undredged) Trinity Inlet….the stench of bureaucracy-induced failure… If the Fungs walk away from Cairns, heads should roll in the halls of state parliament.’ CP Editorial re Aquis 270815. The Cairns Port Development Inc. advertisement appeared in the Cairns Post again on Thursday 27 August DON’T SINK OUR PORT petition advertisement. The Cairns Post article, 22 August, ‘New look at dredging – Ports North told to come up with revised proposal’ can be read at: http://www.cairnspost.com.au/news/cairns/cairns-port-dredging-plan-back-on-the-cards-in-state-government-rethink/story-fnjpusyw-1227493667126. The editorial Cairns Post editorial, EIS backflip a big query, 220815 explains the main problem: ‘If the revised EIS suddenly comes back with a favourable opinion of increased dredging, surely this raises suggestions the government is advising its consultants what outcome they should find rather than merely letting the science do the talking.’ Until a new independent assignment is completed (see below) the project will be stalled, along with realising the $25 billion of benefits forecast over 25 years. Terms of reference for a new assignment to produce a Cairns Port Deepening Plan respond to Treasurer Curtis Pitt’s requests to: ‘recast that EIS and make another proposal which has an emphasis on onshore disposal’; and put another option ‘on the table.’ This plan would provide essential information to enable State and local governments, Cairns business leaders and the Cairns community to understand fully and make informed decisions on deepening and widening the Trinity Inlet and basin. Terms of reference for this assignment have been prepared: Cairns Port Deepening Plan, TOR 081115. Any related decisions made before this or a similar project is completed, including public disclosure, are likely based on conjecture and/or ideology. Cairns Post 4 August, article by State Treasurer Curtis Pitt: ‘Where we differ from the previous government is that its proposal for capital dredging in Trinity Inlet never stacked up on any measure and couldn’t proceed – the volume of dredge spoil and costs over $360 million were uneconomic….The EIS is a live process and will be used as a vehicle to put in an overarching plan for expansion works.’ The $360M has been shown to be very and deliberately exaggerated, and surely ‘expansion works’ does not suggest the proposed vital major port deepening project? The Ports Bill Committee public hearing at Cairns, 29 July, was a great success for supporters of dredging the Trinity Inlet and basin as far as conveying our message to the Committee and emphasising the width and depth of Cairns’ public support. But will it be effective? The Cairns Post front page heading DON’T SINK OUR PORT, editorial, cartoon and double-page spread describe overwhelming support, demanding major changes to the Ports Bill, and action from Federal and State Governments to expedite the dredging. Failure will lead to Cairns’ economy slowly sinking. http://www.cairnspost.com.au/business/state-government-urged-to-rethink-ports-bill-for-far-north/story-fnjpusdv-1227462332057 . The numerous calls to John MacKenzie’s 4CA Talkback were equally supportive. Cairns Post poll, 24 July: ‘Do you support increased dredging of Trinity Inlet’. Result in Monday 27th edition: YES 73%. Friends of the Port of Cairns is now Cairns Port Development Inc. (Incorporation #IA55117). A media release CPD media release 280715 includes a summary of Cummings Economics’ presentation, on behalf of CPD, to the public hearing of the Ports Bill Committee in Cairns 29 July. The presentation is at CPD Presentation to Ports Bill Committee, 290715. Cummings Economics submission to the Qld Coordinator General, Cummings Economics submission, presents a compelling case for the dredging. Conservative calculations of the benefits to Cairns total $1.35 billion NPV – $5 bn in cash terms over 25 years, or at least $200 million each year. Who is stalling these benefits? Adam Gowlett, Branch President of the Urban Development Institute of Australia talked with John MacKenzie on 4CA radio talkback, 21st August, explaining how the Qld State Labor Government is short-changing Cairns in favour of the South East, and Townsville in particular where $65m has just been allocated to dredge and expand their port plus more major expenditure: . Friends of the Port of Cairns Facebook page is at: https://www.facebook.com/PortofCairns. A brief submission from Advance Cairns and Cairns Chamber of Commerce equivocates, noting ‘Ports North will need to be able to continue to undertake incremental development projects…’ : Cairns Chamber, Advance Cairns submission. East Trinity for future urban growth and more vital benefits for Cairns were described in an article in the Cairns Post, 6 June (click on picture below to expand). Radio 4CA July 23, 2015. John MacKenzie speaks with Peter Senior from Cairns Port Development Inc. and Tim Nicholls MP for Clayfield and shadow minister for State Development, Infrastructure and Planning, Small Business and Trade 23rd July 2015 about progressing the dredging of Cairns Harbour. Ports North $5 million draft EIS can be downloaded in sections from: . Click here to see the draft EIS Executive Summary. An aerial photograph of East Trinity, Trinity Inlet and the Cairns CBD in 1942 is shown below, with points of interest flagged (click on graphic to expand). Note the area some ‘greens’ insist should be ‘restored’ to wetlands never was wetlands – it was saltpan, grassland and woodland. …. and this is a recent photo of the Southern end of the East Trinity property. Note the dead Melaleuca trees as a result of flooding by sea water – which CSIRO strongly recommended against. The next 7 sections explain the convoluted steps that resulted in the current dismaying situation. 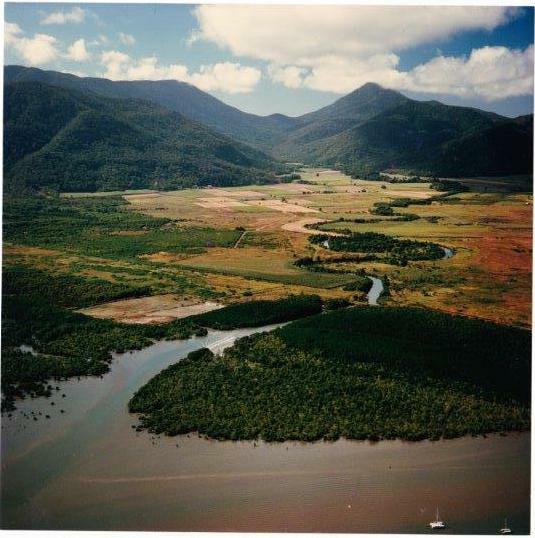 For the latest in the long-running saga concerning dredging the Trinity Inlet at Cairns and reclamation at East Trinity, check the Facebook site, Friends of the Port of Cairns – https://www.facebook.com/PortofCairns. The Facebook site includes a petition you may want to send to the Coordinator General: http://www.gopetition.com/petitions/save-the-port-of-cairns.html – it only takes a couple of minutes to read, then send if you agree. As at 4 June, 1,298 have ‘liked’ the site, and 170 almost-all local people have sent the petition. Check this Post for more background information and proposals. The Cairns Shipping Development Project draft Environmental Impact Statement report was released on Saturday 18 April. State Government Treasurer Curtis Pitt announced that, on the basis of the DRAFT EIS, the government had decided against the proposed Trinity Inlet dredging. Listening to callers on radio talkback shows, the overwhelming overall reaction is extreme dismay. Cairns Labor MP Rob Pyne added to the dismay, as described in the Cairns Post Editorial, 25 April (see full text in Section 3): ‘Cairns MP Rob Pyne’s outburst against the business sector is about as undiplomatic as you’ll ever see from a politician… Industry and commerce quite rightly supports the dredging of Trinity Inlet because it would have brought bigger cruise liners, cargo vessels and navy ships to Cairns and provided a $1.3 billion boost to the economy… He really starts off badly by describing business as the “big end of town” and then his Facebook rant continues with “your unsustainable, unfunded and illogical ‘capital dredge proposal’ will not fly…”. Cairns Post, 30 April, article (see details in section 3): BARRON River MP Craig Crawford has broken political ranks to back the dredging of Trinity Inlet. This post suggests a practical and cost-effective way to avoid dumping the dredging spoil at sea as well as reclaiming the degraded State-owned area at East Trinity. Many related issues are discussed, media coverage is presented and relevant background is explained. Note: This section has not been updated since the draft EIS was released. Some of the assumptions and figures used in the draft EIS are in serious doubt, as are some of the conclusions. It is expected that further checking by different specialist engineers will identify substantially different conclusions that may be more in line with the proposal outlined in the Phase 1 proposal described below. Another variation on Phase 1 (call it Phase 1b) could be, if both the State and Federal Governments are persuaded to allow capital dredge to be placed offshore (currently very unlikely), then the State could sell their 944 ha property at East Trinity to pay all dredging costs, with the proviso that the developer must resolve the current pollution problems on parts of this property. Responding to comments by the previous State Member for Parliament, Gavin King, that East Trinity could not be developed for many years until the dredged spoil has settled, an alternative option is now presented. Pending release of the Environment Impact Statement (EIS) report, it was stated that ‘500 hectares’ of East Trinity land will be required to place the 4.4 million cubic metres of spoil. Given the fact that the State-owned property at East Trinity is 943.6 ha, the residual 443.6 ha of property could be available for development immediately, noting 168 ha of this part is raised, affording grand views across the inlet to the CBD and hills beyond. The original report has been updated to include a Phase 1 where half of the residual 443.6 ha is sold to one or more developers for a nominal sum, on the condition that the developer(s) pay all the costs of dredging, spoil treatment and associated costs, which the original report estimated at $125m. However, as it is understood the Ports North EIS estimates these costs as between $200m and $250m, a midway figure of $225m is assumed. The changes to the original report are shown in red. An alternative with the same effect would be for the state to sell the land outright and use the proceeds to pay for the dredging and spoil treatment. Phase 1 is estimated to produce a profit of $7m, although more land could be available which could enable the level of profit to be increased. The updated report can be downloaded from Dredging and East Trinity opportunities, phased, 230115. The Federal Government’s Reef 2050 Long-Term Sustainability Plan, released on 21 March 2015, includes the intention to: ‘mandate the beneficial reuse of port-related capital dredge spoil, such as land reclamation in port development areas, or disposal on land where it is environmentally safe to do so; [and] to establish a maintenance dredging framework which identifies future dredging requirements, ascertains appropriate environmental windows to avoid coral spawning and protect seagrass, and examines opportunities for beneficial reuse of dredge material or on-land disposal where it is environmentally safe to do so.’ Unfortunately the report becomes suspect when it introduces climate change alarmist ‘PC’ phrases such as ‘ocean acidification’, which are not included in the ‘glossary of commonly used terms’ and is an oxymoron anyway – all oceans are alkaline (PH about 8.1); it is physical impossibility for oceans to become acid, i.e. less than neutrality, about PH 7. Recent government dredging decisions have been based on the Reef 2050 report, which states: ‘Dredging can either be capital dredging, for new channels and berths, or maintenance dredging, necessary to maintain existing and approved dredging areas.’ Port deepening: is NOT a ‘new channel’; it IS necessary ‘to maintain (an) existing and approved dredging area’; and maintenance dredging IS allowed. See Reef 2050 plan excerpts. During an interview by John MacKenzie with Federal MP Warren Entsch on John’s Talkback show, 18 March 2015, Warren described his proposals for the dredging and East Trinity which are identical to the proposal in the Phase 1 report. Leichhardt MP Warren Entsch has applauded the government’s move to ban the dumping of any capital dredge spoil in Great Barrier Reef Marine Park waters, but says it shouldn’t be news to Ports North in regards to their Port of Cairns dredge proposal. One would imagine that achieving a failed promise made by the previous LNP Government at no cost to the taxpayer would be viewed very favourably by the new State Treasurer, Curtis Pitt (who has inherited a very serious budget deficit) as well as the new MP for Cairns, Rob Pyne. Regrettably, complications arising from current charges relating to the State Government member for Cook, Billy Gordon, may delay the long-awaited release of the EIS report for public viewing. ‘…We do need to find a way to get that dredging done. Now, there has been every roadblock put up that could possibly happen….. (details and context below). Note: the Liberal National Party (LNP) was swept from power in a rout at the Queensland State election on 31 January 2015, to be replaced by Labor (ALP) in a coalition with an independent member and Katter party members. To date, in addressing the dredging EIS, the four local Cairns region Labor candidates said only that they will await the EIS release before making any related decisions. It may be relevant that the Labor Treasurer, Curtis Pitt, is the local Mulgrave member and won his seat comfortably. So, back to all in limbo, but with different people in charge! It may also be relevant that the previous Cairns Member, Gavin King, who consistently spoke in almost sycophantic support of Ports North’s plans, lost his seat in a landslide. Surely the general public has a right to know exactly what these ‘roadblocks’ noted by David Crisafulli are; not just hinting at dark secrets that sound more like a conspiracy. Hopefully all will be revealed shortly by the new Labor Government and its four local members. Who gains by delaying the EIS? It would probably be quicker and easier for Ports North to dump the dredged spoil in the proposed extended area at the end of the Trinity Inlet Channel (if some-one else pays). However, this is at odds with the Labor State Government’s view as well as Federal Government and the previous LNP State Government views and directives. Both the Cairns Regional Council and all those involved in the sudden recent announcement of the major residential development at Mount Peter would likely be very averse to competition from another residential development a few kilometres away at East Trinity. Last year (2014) the CRC Mayor, Bob Manning, expressed his belief that the spoil should be placed at sea, and that the State-owned land at East Trinity should not be involved in the dredging project at this time. Who are the ‘road-blockers’ that David Crisafulli (see above) refers to? Exactly what ‘roadblocks’ would detractors be likely to put up? Are there significant connections between the un-named ‘road-blockers’? How much would genuine competition from an additional residential development improve related outcomes for future residents? What will a Labor Queensland State Government do, given that three local members are now Labor (the fourth, Billy Gordon is now independent but likely to align with Labor), including the likely Treasurer, Curtis Pitt, who has the residual of the previous Labor Government’s massive budget deficit to tackle? Note: It is the Coordinator General’s role to assess the EIS, but it seems likely that the outcome will now be influenced by Labor’s plans and may be less influenced by current ‘road-blocks’ (see John MacKenzie’s talkback radio 23 January, below). Will new Cairns State Member, Rob Pyne, be able to fulfil his intention to expedite release of the EIS (see article in Cairns Post, 3 January, below)? Would make a major contribution to Cairn’s economy including allowing large cruise and other ships to enter Cairns port. TWO senior State Government ministers are not ruling out developing the Port of Cairns, including dredging. Queensland Treasurer Curtis Pitt and State Development Minister Anthony Lynham are calling on Ports North to re-examine their Environmental Impact Statement on dredging Trinity Inlet shipping channel. Dredging has been ruled out on economic and environmental grounds by the government, with sea dredge spoil dumping estimated to cost $100 million and land based $365 million. “What we’ve said is that this EIS doesn’t rule out future port development, what it does is say the options that are on the table … are not viable options,” Mr Pitt said. “What we’ve said is that Ports North, as the proponent can go back, recast that EIS and make another proposal which has an emphasis on onshore disposal. CONDITIONS: State Development Minister Anthony Lynham said any dredging of Trinity Inlet would have to include land-based spoil disposal at Ports North’s cost. “It could mean that they need to change focus from being on large cruise shipping to ensure they can look at a suite of works that may need to happen in terms of future port expansion.” He said that might include expanding the Reef Fleet terminal, a barge ramp or a wharf expansion. Dr Lyneham said any dredging would have to include land-based spoil disposal at Ports North’s cost. The Cairns Regional Council has called on the government to defer a final decision on channel dredging and to re-examine the proposal. Ports North declined to comment. Royal Caribbean International commercial director Sean Treacy, who was in Cairns yesterday preparing for the visit of the giant Legend of the Seas cruise ship next month, would not be drawn on the dredging issue. He said the company would continue to work with governments and ports on the best way for their ships to visit. Mr Treacy said the practise of using tender boats to transport passengers to shore at Yorkeys Knob was common for the company throughout the world. A letter to the Cairns Post Editor: Mr Hitchcock’s letter, 9-5, stated ‘Peter Senior’s opinion piece (2-5) is very misleading’. This letter responds to some points in his letter. Far from being misleading, I have provided credible evidence for every point I made in my opinion piece. Warren Entsch, in his article also on 9-5, congratulated me for my ‘very considered contribution’. Mr Hitchcock is entitled to his own opinion, but not his own facts. For instance, a 1942 photo on Warren Entsch’s office wall shows the East Trinity site, far from being ‘largely rehabilitated wetlands’, was mainly salt-pans and grasslands, similar to Portsmith. Mr Hitchcock had attended last December’s meeting of the local Volunteer Fire Brigade, he would have heard the overwhelming support for the dredging and East Trinity reclamation – except, of course, from the CAFNEC attendee. If Mr Hitchcock and his colleagues had not strong-armed Peter Beattie’s government into cancelling the approval for the proposed world-class Royal Reef Resort at East Trinity, which included resolving all pollution problems, then Beattie’s Government would not have had to pay $10m of tax-payers money to NatWest Bank, plus the continuing maintenance costs. The Cairns Shipping Development Project draft Environmental Impact Statement draft report (EIS) was released on Saturday 18 April. State Government Treasurer Curtis Pitt announced that, on the basis of the draft EIS, the state government had decided against approving the proposed Trinity Inlet dredging. The overwhelming reaction of numerous callers on Cairns’ radio talkback was extreme dismay and disillusionment. Most Cairns people are now thoroughly confused. Little wonder as there are so many conflicting views and reports. This article presents a summary of the main factors relating to the proposed dredging and draft EIS, then proposes a way forward. The economic analysis presented in the draft EIS report indicates the dredging project has a very strong benefit-cost ratio, with additional income benefits to Cairns over 25 years estimated in present values, with future benefits discounted at 7% per annum, totalling $1.3 Billion. The $4.2m draft EIS is just that: a ‘draft’. Proper process requires a draft EIS to be published, inviting submissions to the Coordinator General’s office for consideration, then a final EIS. The Coordinator General then is required by law to send[s] a recommendation to the government. No final EIS exists, so presumably the Government has not received the recommendation. What then is the government’s decision based on? Many articles in main stream media focus on alarmist reports and views. For example, TV7 local news often shows a video with brown water around a dredge. This video, provided and paid for by ‘green’ organisations, clearly suggests pollution. Several government departments such as GBRMPA (GBRMPA’s alarmist GBR 2014 report largely blamed climate change for their dire forecasts concerning the Great Barrier Reef, mentioning ‘climate change’ 365 times). The draft EIS estimates off-shore sea disposal would cost about $100m. [Some] Reports based on scientific evidence conclude disposal near shore would not be harmful or environmentally damaging. The report selects the 964.3 ha state-owned East Trinity site as the preferred option for land-based spoil disposal. Most of that area was in continual agricultural production since the first survey in 1894. CSR purchased the property in 1971 and expanded it by constructing a bund wall, then re-contouring the area into productive cane fields. [But when] Cane production [became] was uneconomical, so the land was sold to developers. 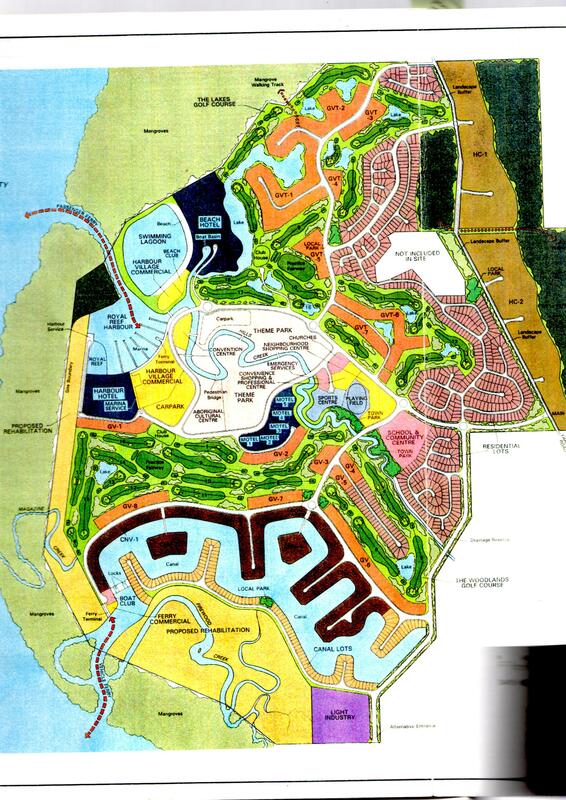 The report notes ‘In the early 1990s a proposal to develop a satellite city on the site attracted community attention, but failed to gain approval. In 2000, the Queensland Government purchased the site.’ More accurately, the Royal Reef Resort proposal for this site was approved in 1995. But the Labor State government succumbed to persuasion from green pressure-groups and overrode the approval. The developer went into receivership. National Westminster Bank commenced legal action against the State, resulting in a $10m out-of-court settlement. The draft EIS assesses placing spoil on 518 ha of low land at East Trinity. This area is highly degraded, costing about $500,000 for annual maintenance that has failed to fix the degradation. CSIRO advice to cover this area with spoil was ignored. The report’s benefit-cost of developing this 518 ha concludes development would be uneconomical. The whole site comprises 518 ha plus partly-raised 428 ha. The latter could be developed immediately, but the report ignores this option. Applying figures from the report to developing the 428 ha area indicates sufficient profit to pay for all the dredging and treatment costs, leaving the 518 ha to be developed later. The report also ignores related benefits such as providing work for Yarrabah people, and funding potential tourist trails on adjacent wetlands. It seems the State and Federal governments is unlikely to be convinced that evidence-based science concludes responsible near-shore dumping of spoil would not be detrimental to the reef – political factors appear to outweigh evidence. 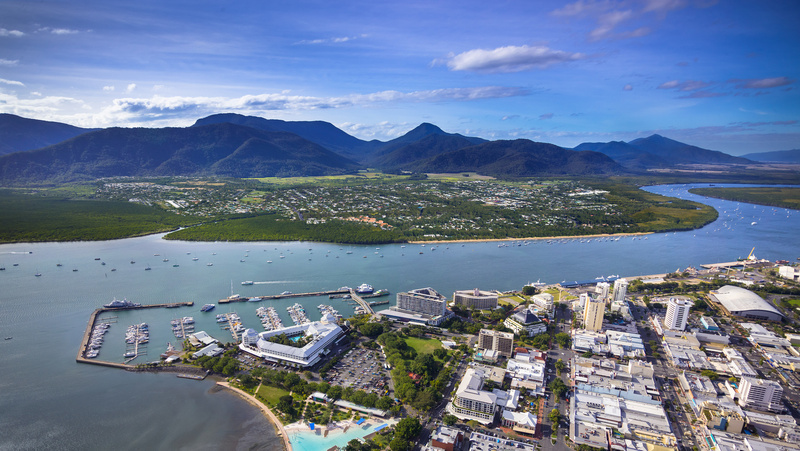 Cairns now urgently needs a credible and visionary leader to assemble a well-respected team to develop as soon as possible a new proposal to achieve the many benefits to Cairns that will accrue when the dredging is completed. Optimising port operations and tourist potential is critical to Cairns’ future. Surely an option that meets environmental standards and is self-funding, or requires minor taxpayer funding, would be acclaimed by our state government? Crawford backs dredging on Trinity Inlet. BARRON River MP Craig Crawford has broken political ranks to back the dredging of Trinity Inlet. He says the widening and deepening of the channel to accommodate larger cruise ships may not happen in the short term, but needs to happen eventually – as long as the Queensland Government has the money to fund it. “I would like to see it happen. What’s restricting us at the moment is certainly the finances for it,’’ he said. The Palaszczuk Government dumped the Cairns Shipping Development Project about two weeks ago, saying there was no economic or environmental case for it. The draft environmental impact statement for the project stated the minimum cost would be $100 million, but only if the 4.4 million cubic metres of spoil was dumped offshore. It would cost an estimated $365 million for land-based disposal options. The LNP had committed $40 million for the project. Mr Crawford believed the dredging of the port could still go ahead, if more research was done on the income generation associated with the cruise industry. “The projection for cruising in Cairns is certainly good, pushing out into 2025, that sort of thing,’’ he said. “We don’t have to do this thing this year, and we certainly don’t have to do this sort of thing next year. “This is not a situation right now where if we don’t dredge the inlet right now, we’re going to miss the boat totally on these sorts of things. “We’ve got a window, so in time, hopefully we can get what we need. At the moment, the restriction is money.” He said he had faith the Labor Cabinet had made the right decision to knock back the proposal. “Coming into the campaign with this government, there was a lot of election commitments given by all sides and a lot of discussion with all groups about financial management and debt reduction and all things like that,’’ he said. “Now we’ve got a Treasurer who’s working on that and obviously trying to make sound financial decisions. “Throwing $365 million at dredging the inlet tomorrow probably wouldn’t be one of his best financial decisions. So I trust him in that, but I do want to see this done at some point in the future, when it’s right.” Treasurer and Mulgrave MP Curtis Pitt said since the EIS was announced, he’d made it clear alternative proposals for port expansion and other initiatives to support the cruise ship industry in Cairns may be considered. Cairns and Far North Environment Centre marine programs co-ordinator Josh Coates invited Mr Crawford to contact the centre to be told about the potential environmental impact of the dredging. Rob Pyne’s rant against business is unfounded. Cairns MP Rob Pyne’s outburst against the business sector is about as undiplomatic as you’ll ever see from a politician. CAIRNS MP Rob Pyne’s outburst against the business sector is about as undiplomatic as you’ll ever see from a politician. The ALP member has been elected to represent everyone in the community – to single out a sector that employs tens of thousands of workers is foolish, if not naive and inflammatory. Industry and commerce quite rightly supports the dredging of Trinity Inlet because it would have brought bigger cruise liners, cargo vessels and navy ships to Cairns and provided a $1.3 billion boost to the economy as well as lucrative taxes and other government fees this administration desperately needs. The Cairns Chamber of Commerce and Advance Cairns have called for the original $40 million promised for the work to be quarantined and even be used for a smaller dredging project. But Mr Pyne wants none of that. He prefers the money to be spent on health, something that is needed, but an area that does not create as many new jobs or generate money. He really starts off badly by describing business as the “big end of town” and then his Facebook rant continues with “your unsustainable, unfunded and illogical ‘capital dredge proposal’ will not fly. It does not stack up and it will not happen”. He then goes on to say that he is only interested in improved health, education, training, disability, community and sporting opportunities for the “ordinary people” of Cairns. Industry and commerce quite rightly supports the dredging of Trinity Inlet because it would have brought bigger cruise liners, but Cairns MP Rob Pyne believes it will only suit “the big end of town”. Mr Pyne singles out “Tories” (conservatives) and says he will only deal with health board chairman and conservative Bob Norman. The post also contains a photo of a man lighting a cigar with an American banknote. Mr Pyne’s criticism is sure to alienate a large section of the community and appears to show he is not concerned about business, the sector which employs the most people in his electorate and produces the billions of dollars needed to keep the economy humming. It’s no secret that the city’s economy continues to struggle and still needs a major project such as Aquis or the Aspial towers to start as soon as possible. Fortunately his colleague, Mulgrave MP and State Treasurer Curtis Pitt, has a far better grasp of what makes this city tick and will achieve a lot more than Mr Pyne’s list of priorities. At least our business leaders have shown the sense not to react to his surge of illogical rage. LNP spent $4.2 million on failed Cairns Trinity Inlet dredge study. DREDGE DIFFICULTY: A huge amount of money was spent on finding out dredging Trinity Inlet is not feasible. TAXPAYERS forked out $4.2 million for a study which strongly found against the dredging of Trinity Inlet. [Editor’s note: these first two paragraphs are totally incorrect.] The State Opposition’s infrastructure spokesman Tim Nicholls yesterday revealed how much the Newman government contributed to the Cairns Shipping Development Project, which was knocked back by Labor on Friday. The long-awaited draft Environmental Impact Statement (EIS) for the widening and deepening of the city’s shipping channel was released on Friday, showing there was no environmental nor economic case for the project. The 3000-page report stated the minimum cost of the project would be $100 million – but only if the 4.4 million cubic metres of spoil was dumped offshore. Both parties have committed to preventing dredge spoil from being dumping within Great Barrier Reef waters. The LNP promised $40 million towards the project in 2012 as an election commitment. In a statement yesterday, Mr Nicholls said it was disappointing the Palaszczuk Government was “pandering to the Greens” with no thought or plan on how it would open up tourism or boost the economy and jobs in the Far North. “The money spent on this project is an investment in the future of Cairns and unfortunately the Treasurer has dismissed this project too quickly without looking at all the options or considering funding partnerships with the private sector,’’ he said. The former Queensland treasurer said with the ever-increasing size of new cruise ships, it was essential the port was positioned to respond. “Dredging Trinity Inlet would have provided access for larger cruise ships, boosting economic and tourism benefits for the region,’’ he said. “It is now on Labor to detail what their plan is to bolster and support industry, tourism and create jobs in Cairns.” He said the report was not released before the election as the Co-ordinator-General had to take into account the changing Federal Government position on dredge spoil dumping. His spokeswoman did not respond when asked if the LNP would still push for the dredging of Trinity Inlet. Cairns and Far North Environment Centre marine programs co-ordinator Josh Coates said the project was never necessary, never environmentally responsible, and did not represent a good use of taxpayers’ money. “The fact is that there is no need to expand the port for larger cruise ships, which continue to visit Cairns transporting passengers to shore at Yorkeys Knob,’’ he said. “We have welcomed the State and Federal governments’ commitment to put a stop to new dredge spoil dumping offshore in the Great Barrier Reef marine park. “This ban should be extended to all World Heritage areas to address dumping elsewhere in Queensland.” He said while the Government had ruled out funding the project and released the EIS for legal reasons, it was still important for people to have their say on the project. Trinity Inlet dredging canned after Environmental Impact Statement raises issues. CAIRNS’ potential as a mega-cruise ship and navy hub is sunk after the State Government used environmental and financial factors to stop the required dredging of Trinity Inlet. The move is sure to anger business leaders hoping for more cruise passengers in Cairns. Treasurer Curtis Pitt yesterday released the long-awaited draft Environmental Impact Statement which he said showed there was no case in favour of dredging. “The $40 million the Newman Government committed to the project in 2012 was politically cynical and misleading because it was never enough to make the project viable,” he said. “The proposal, which includes dumping dredge spoil at sea, would cost more than $100 million and the land-based dumping options about $365 million.” Releasing the document is a legislative requirement but the Newman administration refused to make it public prior to the January election. LACKING BENEFIT: Treasurer Curtis Pitt yesterday released the long-awaited draft Environmental Impact Statement into dredging Trinity Inlet, which he said showed there was no case in favour of dredging. Mr Pitt said he wanted Queenslanders to have an accurate understanding of the economic costs and environmental impacts of dredging. “This EIS highlights the Newman government’s reckless disregard for the one of Queensland’s most valuable assets, the Great Barrier Reef,” he said. “It was never fully funded and anyone who looks at the proposal and its environmental and economic impacts can see why the government is not proceeding with it. “The Palaszczuk Government opposes the recommended option in the draft EIS to dump dredge spoil in the Great Barrier Reef Marine Park and World Heritage Area.” Ports North had proposed to widen and deepen the Port of Cairns channel in Trinity Inlet to allow the future expansion of the HMAS Cairns naval base and accommodate mega-class cruise ships. Great Barrier Reef Minister Steven Miles accused the LNP of having “complete disdain for Queensland’s environment” and putting election pledges ahead of sound economic policy. “We’re not going to waste $40 million subsidising a dredging project which has now been exposed as environmentally and economically unsustainable,” he said. “The money the LNP wanted to waste on this unviable project would be far better spent on frontline services or job-generating projects, including initiatives in Far North Queensland.” HOPES DASHED: Ports North had proposed to widen and deepen the Port of Cairns channel in Trinity Inlet to allow the future expansion of the HMAS Cairns naval base and accommodate mega-class cruise ships. PICTURE: BRENDAN RADKE Source: News Corp Australia. The Great Barrier Reef supports about 70,000 full time jobs and contributes $5.7 billion a year to the Australian economy. State Development Minister Anthony Lynham said on that basis alone the dredging proposal had no merit. “When people look at the EIS they will see why the only option is to discontinue the project,” he said. “That’s why the government, in line with its election commitment, has decided to withdraw the money allocated by the Newman government. “The Great Barrier Reef needs to be protected not only as a unique natural wonder, but also because of its economic importance.” Copies of the EIS will be available at the Cairns City Library from April 20 to June 1. Electronic copies can be ordered by phoning 4052 3888. To lodge a submission on the draft plan, click here. A Letter to the Editor in the Cairns Post 20 March: The article ‘Port EIS release delayed – Labor tardiness questioned’ (18-03) is very worrying. The Cairns Post is to be congratulated for requesting a copy of the draft EIS under the Right to Information laws, subsequently denied by the Coordinator General. The department says there is an “intrinsic responsibility” to not disclose this multi-million dollar taxpayer-funded EIS. Cairns Labor MP Rob Pyne notes this denial is “undemocratic”. The delay and denial are also disgraceful and completely unacceptable. It appears that a tiff between Ports North and the Coordinator General has somehow managed to delay progressing this project and the major economic benefits it will bring to Cairns. The question must be asked: who is running our government? A few unelected bureaucrats, or our elected representatives? Hopefully this denial will be a catalyst to force immediate progress of this vital project. An article in the Cairns Post 19 March: A REPORT into the potential dredging of Cairns Port is expected to be publicly released “within weeks”. Cairns MP Rob Pyne has spoken with Minister for State Development and Minister for Natural Resources and Mines Dr Anthony Lynham about the draft Environmental Impact Statement for the Cairns Shipping Development Project, which has been locked away by the government since late last year. The Minister’s department blocked the release of the taxpayer-funded document after it was requested under Right To Information laws by the Cairns Post. Mr Pyne said Dr Lynham gave him an undertaking the 3000-page report would be released publicly after an upcoming Cabinet meeting. He could not say, however, how soon that would be, instead saying he would be “disappointed” if it was any longer than the next two months. “All I can say is it’ll be tabled over coming weeks and discussed by Cabinet, and then made public,’’ he said. Mr Pyne had previously questioned the department’s transparency but said the latest development had restored his faith in the Labor ­Government. He said the Far Northern community needed the report to inform the debate about whether Trinity Inlet should be widened and deepened to attract larger cruise ships to the region. “We need to look at the report and look at whether it actually stacks up,’’ he said. “I think the report will tell us if such expenditure would be supported or such an investment would stack up, in terms of benefits to the Cairns ­community. “It will, very importantly, look at any environmental costs as well.” Ports North submitted the EIS to the Queensland Coordinator-General and the Federal Government’s Department of Environment late last year. The Newman administration didn’t allow the document’s release before the January election. Cairns and Far North Environment Centre director Angelika Ziehrl welcomed the EIS finally being made public. “CAFNEC is looking forward to this finally being released so the public and CAFNEC can comb through it,’’ she said. Green groups have raised concerns the large quantity of sediment generated by dredging could impact the marine environment. Two Cairns Post articles, 18 March: Cairns MP Rob Pyne questions government decision to block port study from public release. THE transparency of the Queensland Government has been questioned by one of its own Labor MPs after it blocked the release of the ­report into the proposed dredging of Cairns Port. The Department of State Development has denied The Cairns Post’s request under Right to Information laws for a copy of the draft Environmental Impact Statement for the Cairns Shipping Development Project. The long-awaited report was due to be released for public comment late last year but is still under consideration by the Co-ordinator General. The department says there is an “intrinsic responsibility” to not disclose the taxpayer-funded EIS, which the Co-ordinator General needs to be satisfied adequately covers the terms of reference. “The information was ­received in circumstances which would make it unacceptable conduct for the ­receiver to disclose the information in a way the giver has not authorised,’’ a departmental officer wrote. Once the Co-ordinator ­approves the EIS, it will be ­released for public and state government advisory agency consultation for six weeks. The Newman Government committed to fully funding the EIS as part of its $40 million investment in the project. Cairns Labor MP Rob Pyne said for the department to deny the document’s release under RTI was “undemocratic.” “These things need to be transparent and the document should be released for people to talk about,’’ he said. Advance Cairns CEO Mark Matthews said it was in the ­region’s best interests to see the report, to have a way forward for the dredging project. The Office of the Co-ordinator General did not respond to questions about when the report would be released. Future in the balance. Far Northern leaders are adamant the region’s economic future hinges on a plan to develop the Cairns Port. The Cairns shipping Development Project promises to inject $634 million of 25 years into the local economy and create more jobs by dredging the Trinity Inlet to accommodate large cruise ships. But complete bans on sea dumping proposed by the state and federal government could jeopardize the project. Federal Leichhardt MP Warren Entsch said a land site must be found for dredge spoil, no matter what the cost. Cairns Mayor Bob Manning was confident port development and a healthy reef could co-exist. “It’s inevitable that our region is going to grow and it’s inevitable the port will need to grow”, he said. 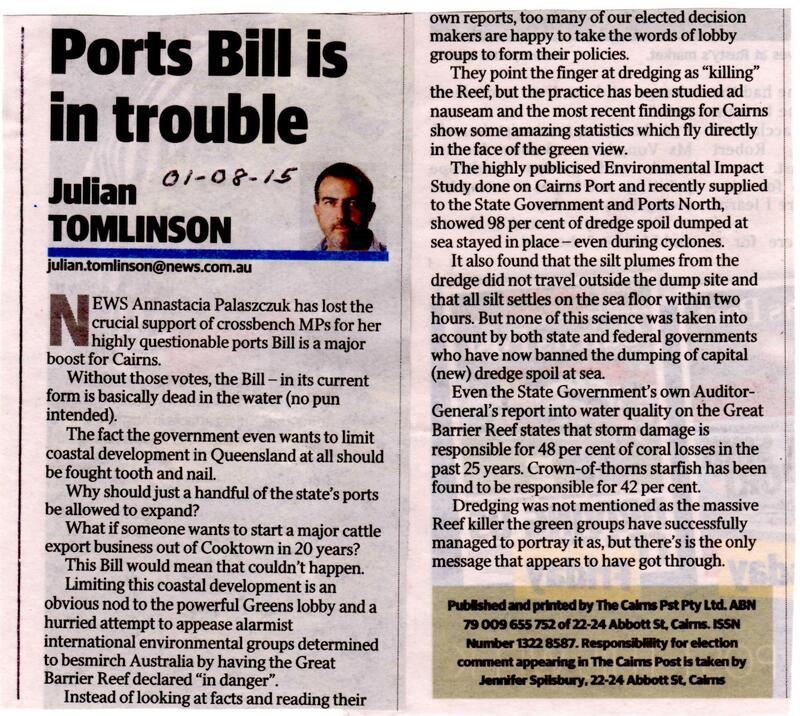 Cairns Post article, 27 February: Still no word on Cairns port Environmental Impact Statement. The release of a long-awaited study into the dredging of Cairns’ port has been further stalled by the new Queensland Government. It’s now been five months since the draft Environmental Impact Statement (EIS) for the Cairns Shipping Development Project was last expected to be made public. The state’s Co-ordinator General has now delayed the report’s release, citing the Palaszczuk Government’s policy on dredging within the Great Barrier Reef marine park needs to be taken into account. Prior to the state election, the ALP committed to preventing dredge spoil associated with the project being dumped within the marine park. A Department of State Development, Infrastructure and Planning spokesman said the 3000-page document would not be released at this stage. “The implications of the new State Government’s policy statements and position on the project need to be taken into account,’’ he said. “In particular, the Co-ordinator General is seeking the advice of the proponent on how it intends to meet the government’s commitment of no sea-disposal.” Cairns MP Rob Pyne, who previously vowed to make the report public, said he would continue to push for the study’s release. “As we speak I’ve emailed the minister requesting its release and awaiting reply,’’ he said. “How can you have an intelligent public discussion if this information isn’t made public?” Widening and deepening of Trinity Inlet will allow the city to accommodate larger cruise vessels in its main channel. Ports North has proposed to remove 4.4 million cubic metres of dredge material from the inlet and deposit it either at sea or on land. One of the sites under consideration for dumping the sediment is inside the Great Barrier Reef marine park. Minister for Environment and Heritage Protection and Minister for the Great Barrier Reef, Steven Miles, said the Co-ordinator General was assessing if the EIS was “adequate and suitable” for public release. “The Government was elected on a platform of protecting the Great Barrier Reef, which I know is important to many Cairns residents and the Cairns economy,’’ he said. “Consequently, the Government will not support any proposal that involves the dumping of dredge spoil offshore. “I would expect that the Ports North EIS has included a land-based disposal option (Editor’s note: assessment of land-based options is a requirement of the EIS Terms of Reference – see below). “When the EIS is released for public comment my department will assess the project and provide advice to the Co-ordinator-General.” Cairns and Far North Environment Centre marine programs co-ordinator Josh Coates said the project should be shelved. An article in the Cairns Post, 3 February: CAIRNS MP Rob Pyne has vowed to publicly release a study into the dredging of Trinity Inlet – as long as he has the power to. The former Cairns Regional councillor has cemented Labor’s commitment to preventing 4.4 million cubic metres of dredge spoil associated with the Cairns Shipping Development project from being disposed within the Great Barrier Reef Marine Park. Mr Pyne also said if his party formed government he would endeavour to publicly release the long-awaited Environmental Impact Statement – which despite being completed late last year, has yet to see the light of day. “If I have the power to make it public, I will make it public,’’ he said. “The public paid for (the report).” He said his opinion of the project, to widen and deepen the city’s main shipping channel, was that it still “needed to stack up”. Ports North has proposed to remove dredge material from the inlet and deposit it either at sea or on land. Sites under consideration for dumping of the material include East Trinity, Admiralty Island, on cane land in southern Cairns near the inlet, along the Esplanade and near the Cairns Airport. Five offshore sites were also under consideration, including areas within the marine park. Queensland’s former Deputy Premier Jeff Seeney late last week blamed Ports North for the delay in releasing the project’s EIS, which was initially expected to happen in September. In a brief statement yesterday, Ports North chairman Brett Moller said the authority had submitted the draft EIS to the Queensland Co-ordinator General last year. An inside source revealed that the authors of this article were ‘strongly ticked off’ for including this photograph, and were directed to remove this and associated photos from the newspaper’s library. The source did not know who made the initial complaint, or why Cairns Post reacted this way, but it is interesting to speculate when considering the ‘road-blocks’ noted above. A 22-minute interview with Peter Senior can be listened to at Note: if necessary, copy the address and paste into your internet link box. John MacKenzie kicked off over two hours of non-stop discussion on the State Government’s decision to turn down the dredging proposal with an interview with Cairns Regional Council Mayer Bob Manning. Bob explained at length how this was a shocking and altogether wrong decision for many reasons. Bob noted that all ‘the science’ showed there would be no problems if the proposed dredging spoil was placed in the proposed area at the North East end of the Trinity Inlet. A later caller added that internationally-recognised reef experts, Dr Walter Starck and Professor Bob Carter, endorsed this view, noting all the inner areas between the land and reef already have some one metre of spoil at the bottom of the shallow sea from centuries of sediment drained for the land. Other callers noted: the $365m cost stated in the draft EIS was excessively high, and ignored the potential for selling some or all of the excess State-owned land at East Trinity to pay for the dredging and treatment costs. Several references were made to the two proposals linked at the start of this post. Every caller presented additional information in dismay, and in some instances, disgust, that the State Government had made this decision before even waiting for submissions on the DRAFT EIS report. The overall view was that Cairns leaders and the general public must make their views known to the State Representatives to dissuade them from this fundamentally wrong decision. The following day’s show continued the theme for nearly two hours as well. During an interview by John MacKenzie with Federal MP Warren Entsch on John’s Talkback show, 18 March 2015, Warren described his proposals for the dredging and East Trinity which are identical to the proposal in the Phase 1 report. Would David, had he still been Minister, have succeeded in changing Gavin King’s views, as quoted below? And how will the new Cairns Member, Rob Pyne address these points now Gavin King is no longer in a position to ‘road-block’? ‘It would be 20 – 30 years before the land at East Trinity could be developed’ – thousands of other reclamations started development within a few years, including Portsmith and Trinity Park. ‘It’s just unaffordable, certainly in the short-term…’ – Gavin continues to ignore the potential for revenue gains from development. ‘A bridge would be required’ – not necessary, noting it is faster to drive from East Trinity to the CBD in rush-hour than from Palm Cover. ‘The change by Federal Government regarding dumping spoil at sea caused Ports North to carry out considerably more assessments which had caused the delay’ – Not so; the final Terms of Reference were released in November 2013 requiring all land-based options to be fully assessed. This was 4 months before Ports North let the EIS contract to ARUP. Portsmith reclamation: ‘That was a century ago’ – Portsmith reclamation was completed in the late 70s; many of the current buildings were completed in the 80s. Peter asked why Gavin King had said it would be 20 – 30 years before the land at East Trinity could be developed, then noting there was ample land currently available for development that would not be required for spoil placement, further noting such development could pay for all the costs of dredging and spoil treatment. Andrew said they were aware of such options but it was necessary to wait for the EIS report. Peter asked why the EIS report was delayed so much past it’s original promise of May 2014, given the Terms of Reference had not changed since the original TOR published in November 2013, requiring full evaluation of all land-based options. Responses from Andrew and Michael did not really address the question, noting again the need to await the Coordinator General’s completion of the EIS assessment. Gavin said it would be 20 – 30 years before the land at East Trinity could be developed. Peter noted that ‘only’ about 500 ha of the 946.3 ha of State-owned land at East Trinity was apparently required to place the spoil. So the other 446.3 ha could potentially be available for development immediately, including the 168 ha of raised land at the North East end. Gavin said a bridge would be required. Peter noted this was costed by GHD in the late 90s at $400m, so about $800m could be realistic now. But a bridge is not needed, noting it takes longer to drive from Palm Cove to the CBD in the rush hour now than it takes to drive in from East Trinity. A small, regular fast passenger ferry from East Trinity across the 1 Km of water to the Pier marina would probably attract considerable numbers of residents for work and pleasure. Gavin twice said that the change by Federal Government regarding dumping spoil at sea had caused Ports North to carry out considerable more assessments which had caused the delay. Peter pointed out that the project Terms of Reference had not changed after the November 2013 update that was the basis for the ARUP contract. Full assessment of all potential land options were a requirement of the original terms of reference, so nothing has changed. Gavin said Peter should talk with Ports North, as he had previously offered to arrange. At that point, John MacKenzie terminated the discussion due to shortage of time. Peter had been about to tell Gavin that Norm Whitney and he had three long meetings: first on 18/o4/13 with the Mayor and executives from Ports North; then 3/9/13 with Ports North executives plus ARUP consultants; then a month later with the ARUP environmental consultant at East Trinity; then 3/6/14 Peter met with the Mayor to discuss progress – we agreed, politely, to disagree on most points. Ports North clearly indicated at the three meetings they considered on-land disposal would be a far more costly option with no benefit. An earlier conversation on this talkback show between Gavin and ‘Bill’ concerned the issue of Portsmith having been successfully reclaimed. Gavin said this was ‘a century ago’. In fact filling at Portsmith was mainly carried out during 1960’s and completed in late 1970’s. Buildings at Portsmith, especially around Aumuller street and Redden Street, were constructed mainly during 1980’s. During an interview on the TV7 Bold Report on 16 November, the Hon Julie Bishop, Minister for Foreign Affairs and Deputy Leader of the Liberal Party stated: ‘I have been involved in some detailed discussions about the Great Barrier Reef and Australia is committing to world best practise in the conservation and preservation of the Great Barrier Reef, and last week we ann0unced there would be no dumping of capital dredge waste in the marine park’. How much clearer can the Federal Government be? The report at Dredging and East Trinity opportunities 081214 presents details and several photographs that tell the story of East Trinity. Then you will be able to compare this proposal with the Ports North EIS report when it is released by the Coordinator General. Ports North originally stated the EIS report would be presented to the Coordinator General last May, some 8 months ago. Release to the general public would be authorised by the Coordinator General at a later date, expected to be announced in the Cairns Post. Further information is noted below in. An outline of the alternative options considered and reasons for selecting the proposed development option. Detail the criteria used to determine the alternatives and provide sufficient detail to convey why certain options or courses of action are preferred and why others are rejected. Provide descriptions of all feasible alternative land-based spoil disposal. Sufficient baseline economic data to underpin a comprehensive assessment of the direct, indirect, cumulative, costs and impacts of the project. The indirect impacts likely to flow to other industries and economies from developing the project, and the implications of the project for future development. The EIS should therefore include full responses to the five points above with regard to the East Trinity option without the need for further extensive investigation. Ports North initially stated the report would be delivered in May 2014. Later the delivery date was stated as September 2014. In an article in the Cairns Post, 9 August 2014, Brett Moller, chairman of Ports North, wrote: ‘After 18 months of studies, the project EIS is due for submission to government later this year’. A later statement from Ports North noted an ‘October’ completion. On 6 November Chairman Moller told John MacKenzie on his radio show the report would completed ‘by the end of this year’. The report will be available for public release when the Coordinator-General’s office authorise this. Cairns is a small idyllic city on the North-East coast of tropical Queensland. The Great Barrier Reef, rain forest and glorious tropical weather are just three features that attract visitors from across Australia and the rest of the world. Many cruise ships visit Cairns, docking at the cruise terminal adjacent to the central area with its many restaurants, entertainment facilities and the lagoon by the marina. Larger cruise ships have to anchor a few kilometres North of Cairns off Yorkeys Knob. Passengers come ashore in tenders. A Channel 7 TV News item on 28 November 2012 interviewed several passengers who were dismayed at the long boat trip to get ashore, then the lack of welcome, unlike other ports they visited that have music, gifts of flowers and shelter. Queensland State MP, Gavin King, suggested putting up a welcome sign. It was dismaying to hear a cruise director from the Celebrity Solstice, visiting Yorkeys Knob on 4 December 2012, tell me: ‘It’s like a dead city; no welcome, no taxis for my passengers…’. Almost 2 years later, on 19 November 2014, the Cairns Post announced the ‘Yorkeys Knob’s newly upgraded $2.2m cruise liner facilities will host its first cruise this morning. Passengers from luxury P&O vessel Pacific Dawn are expected to arrive ashore at Half Moon Bay Marina from 9.30 this morning. A two-year joint venture between Ports North, Yorkeys Knob Boating Club and the State Government, the upgraded facilities include a reconfigured car park with a large covered area, an improved jetty, resurfacing and lengthening of the boat ramp and a new floating walkway.’ A temporary shade tent was again erected on the nearly-sealed area for waiting passengers. Ports North propose to dredge the Trinity Inlet channel to provide sufficient depth of water for all except the largest mega-cruise ships to navigate the channel and dock at the central cruise terminal – clearly a major advantage for cruise passengers, and certain to attract more cruise ships. This dredging project has many implications and potential major benefits in addition to attracting more cruise ships. 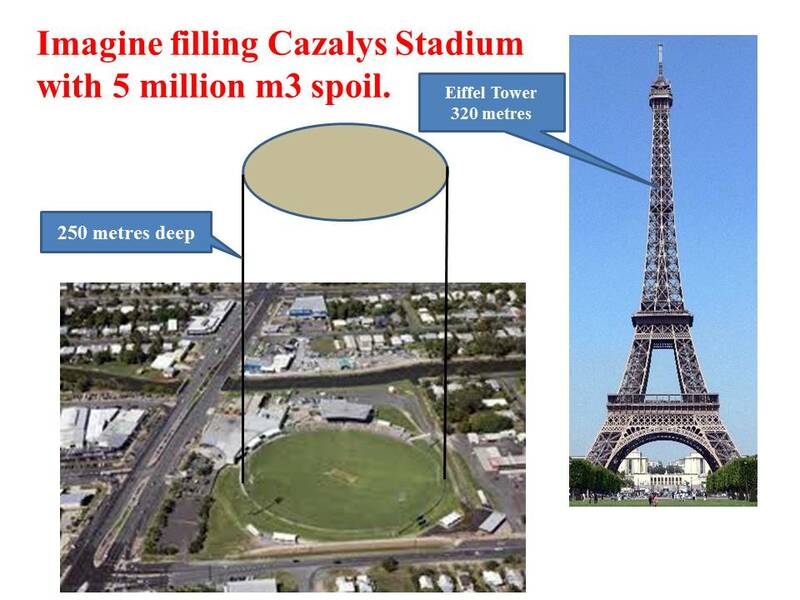 The downside is that Ports North plan to dump the massive amount of spoil – 5+ million cubic metres initially plus ongoing maintenance – from the dredging in an extended area near the Great Barrier Reef (click on diagram of Cazalys Stadium for clearer definition). The Queensland Coordinator-General issued draft Terms of Reference (TOR) for the dredging project assessment; submissions were invited so anyone could comment on the draft TOR. The deadline was 29 October 2012. One submission presented can be viewed at Submission for Cairns Shipping Development Project draft Terms of Reference, Peter Senior, 291012. This submission canvasses the key issues and presents several suggestions, in particular noting that dredging spoil could be used as a valuable resource for several land-based projects such as bulk-fill to assist fixing the environmental disaster at East Trinity. It was very gratifying that the Coordinator-General’s considerably revised Terms of Reference document included a well-balanced approach that requires rigorous assessment of a range of land-based solutions for the use of Trinity Inlet dredging spoil. On 25 September 2012, the Queensland Government declared the project as a “significant project for which an Environmental Impact Statement (EIS) is required”, following the submission of an Initial Advice Statement. The Queensland Coordinator-General is managing the State’s assessment process and Terms of Reference (TOR) for the project are available at www.dsdip.qld.gov.au/assessments-and-approvals/cairns-shipping-development-project. 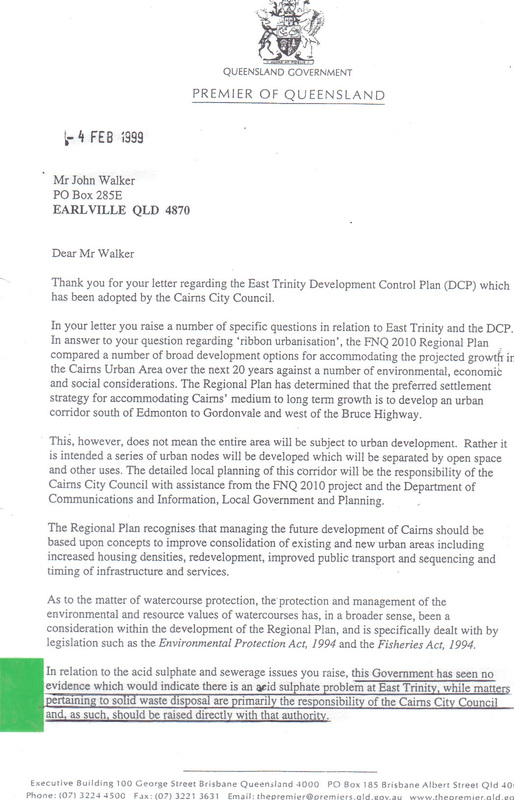 A ‘Deputation’ to the Cairns Regional Council was planned to be presented to the full Council on 27 February 2013. This was cancelled hours before the scheduled start time because several people felt strongly that the presentation would be counter-productive at that time. Here is the Power Point presentation that was planned for the deputation: Trinity Inlet dredging proposal (2.8 MB). Ports North announced on 22 April 2013: ‘The Cairns Shipping Development Project took another step forward today announcing Arup in partnership with BMT WBM as the Lead Consultants who will work with Ports North to deliver a comprehensive Environmental Impact Statement (EIS) to meet the requirements of both the State and Commonwealth Governments.’ As at 3 September 2013 the consultants were making good progress towards completion of the draft EIS report. Many Cairns local business people and community members look forward with great interest to reading what the report has to say, and what the Queensland Co-ordinator General’s departmental response is, regarding the EIS terms of reference points (as listed above). It is likely the lowest direct cost of the total dredging project will be to dump the spoil in an extended area by the current dumping area. This solution also appears to fulfil the Ports North objectives. A primary concern remains that there may be major benefits for the Cairns community, economy and environment through managing this massive amount of dredging spoil as a valuable resource that could contribute towards several important on-land projects – ‘may be’ because no significant investigation or cost-benefit studies have ever been undertaken in the past to address this issue. Yet landowners face stiff penalties for such vandalism. A range of signs, community concern, media articles and reports such as the SKM’s ‘Improved Dredge Material Management for the Great Barrier Reef Region’ suggest dumping dredging spoil at sea off the Queensland coast has a very limited life. The fundamental issue is this: is it better for the Cairns community to place this massive amount of spoil in an extended area close to the Great Barrier Reef, with possible attendant dangers, or to manage this spoil as a potentially valuable resource that may enable the large East Trinity area – only 2 kilometres from Cairns’ CBD – to be reclaimed and become part of Cairns future development. The EIS report is required to address this issue. Stepping back a few months, a meeting on 31 October 2013 with one of the consultants at a property adjacent to the Queensland State-owned East Trinity area in question demonstrated at that stage the consultants had minimal knowledge of the current and past status and events that lead up to the state of this ‘disaster area’. Several previous reports about the area were passed on to the consultant, together with detailed explanations of related past events. CAFNEC’s views for many years have been consistently against any development (recall they were strongly against the superb and world-acclaimed Skyrail project). Their argument against dumping spoil at sea is quite widely supported by Cairns’ locals. Their other argument concerns the dredging spoil ‘…so the obvious solution of using it as fill for building really isn’t an option in this case because of the nature of the sediment’. They fail to point out that the real issue is the cost of treating and compaction, which of course CAFNEC do not address, nor how this spoil from the same area was successfully used over many decades to cover then develop much of Portsmith. Note too there have been major advances in spoil management technology and equipment for preloading and compacting since Portsmith was created, including for the forthcoming Abbotts Point project. Perhaps CAFNEC’s ‘obvious solution’ is indeed both practical, economic and would provide a range of major benefits for most Cairns residents and businesses. Ports North chairman Brett Moller sensibly noted: ‘Ports North are not prejudging the outcome of the EIS in relation to the relocation of dredge material ….‘. That was, of course, before the 11 month delay – and counting….. The deadline for the project’s environmental impact statement was extended to September to allow for further water-quality studies. Earlier this month, hundreds of residents rallied in Cairns to protest port developments near the Great Barrier Roof, including the Trinity Inlet proposal. 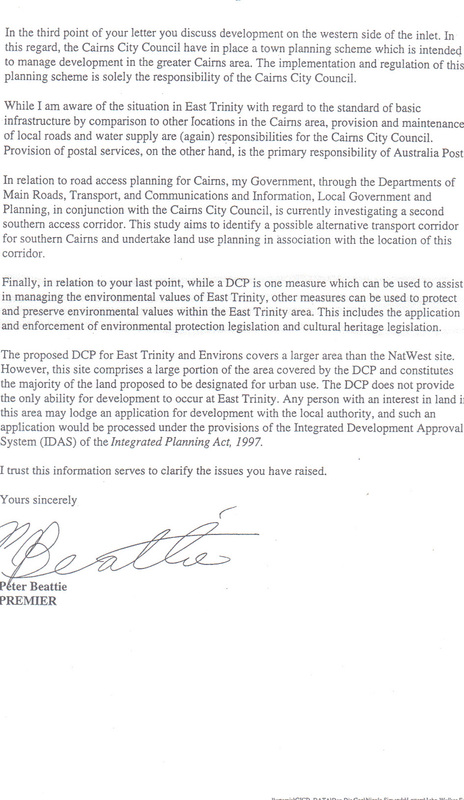 The plan that was prevented when Peter Beattie’s Labor government withdrew its approval to appease environmental activists, resulting in Cairns losing what would have been a fine development, and paying the National Westminster bank what is rumoured to have been many millions of dollars to avoid being sued. The Royal Reef AIS and EIS reports (respectively 1992 and 1995), two exceptionally comprehensive 40 mm thick reports produced by a team of specialists led by Brannock Humphreys, Town Planning Consultants, describe the proposal in detail. 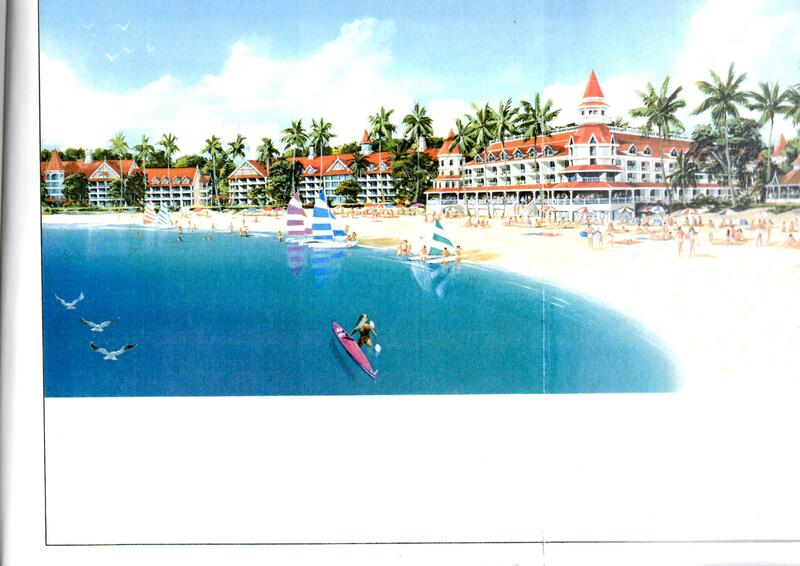 Section 10.0 CONCLUSIONS notes: ‘There will be no major detrimental impacts to the environment as a result of the proposed development which has been modified to be generally in accordance with the Trinity Inlet Management Plan.’ A selection of diagrams from the report are below: a hotel and beach, a plan of the whole resort and a location plan. It seems The Cairns Post is the only ‘leader’ pushing a vision for Cairns on a range of issues including many articles describing the manifest benefits that would result from dredging the Trinity Inlet. One example was published in the Cairns Post in May 2012: Cairns Post front page 08-05-12 Cairns Post follow-on 08-05-12. Hopefully Cairns’ civic leaders will take up the challenge soon. This entry was posted in Cairns Port Development. Bookmark the permalink.